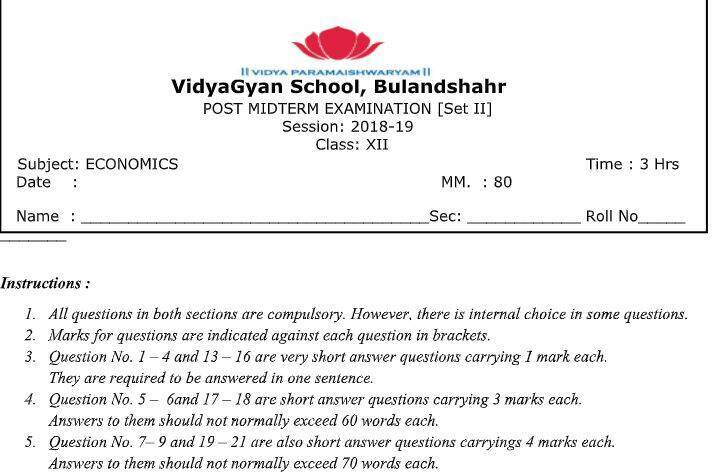 CBSE Class 12 exams 2019: The Central Board of Secondary Education (CBSE) will conduct board examinations from February for the coming academic year 2019. The board has already released a list of vocational subjects for the examinations that will be conducted from February to March 2019, the schedule and date of the examinations will be released later. From next year, the students need to get a minimum of 33 per cent marks in theory and practical combined to declare pass in the subject to get pass in the Class 10 examinations. What is normative economics? Explain the fundamental economic problem of ‘how to produce’. State the relations between MR and TR with a diagram, when the Price falls. will be further reaction of the consumer? Give reasons. equilibrium? Why or why not? What will a rational consumer do in this situation? Explain. 10. ‘Uniform price in key feature that makes Perfect Competition different from other market forms’. a. Why does the demand curve of a monopoly firm less elastic? Use diagram. b. Discuss ‘price discrimination’ feature of monopoly. 13. Give any one characteristic that make money a ‘medium of exchange’. How does money solve the lack of unit of account of barter system? 16. Primary deficit and interest on debt are Rs 11500 Crores and Rs 3500 Crores respectively. 18. Estimate the value of aggregate demand in an economy. Discuss the role of government budget in reducing economic inequality in the country. b. Distinguish between ‘current account’ and ‘capital account’ transaction of BOP. Elaborate ‘deficient demand’ with a diagram. What are the government measures to reduce it?